Our local library has a really great selection of movies to rent for free. 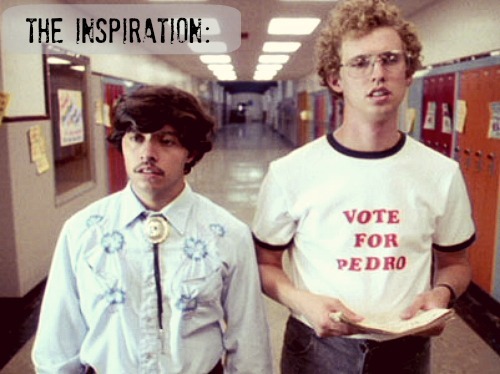 We brought home four Potter family favorites this past weekend, including the cult classic Napoleon Dynamite. Sweet! 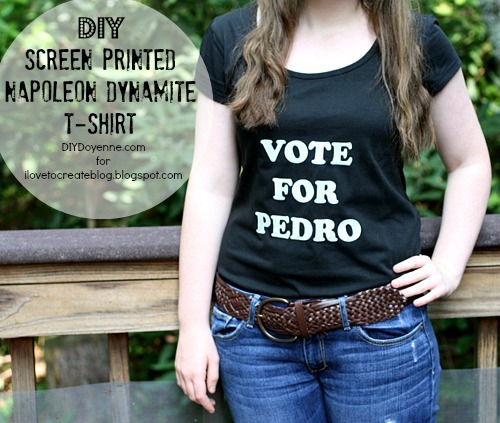 As soon as we saw the Vote for Pedro t-shirts again, we knew what our DIY teen craft project would be for the week. Using our trusty Tulip Screen-It and a retro style font, we had our sweet t-shirts whipped up in a flash. 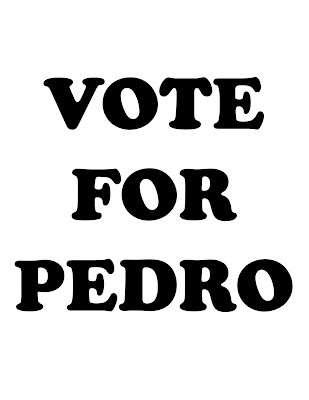 Vote for Pedro, and all of your wildest dreams will come true. 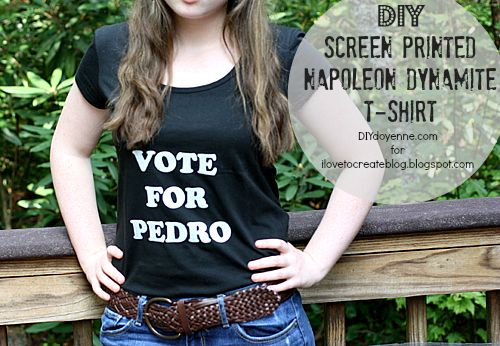 Before you can print your shirt, you'll need to create the screen. Follow the instructions below and on this video to ensure success. Start by downloading and printing the image above at original size 8.5"x11" in black ink on an inkjet printer. (Or make your own using Cooper Black font.) You'll need to burn your screen in a room without exterior light, like a bathroom. 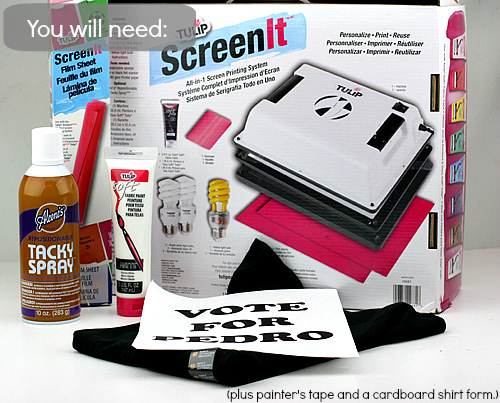 Bring in the Screen-It machine, a lamp that will fit the yellow bulb that comes inside of the machine, your screen still in the package, your t-shirt, the squeegee that comes with the machine, spray adhesive and printed image into the room. Put the yellow bulb in your lamp and turn it on. Turn off any other light. Now spray the foam area on the platform of your machine. Place the screen on your machine, squeegee out any air bubbles so it's flat. Spray the front of your printed image, place it on the screen facing down and use squeegee to remove any air bubbles. Place cover on top, turn machine on and wait 8 minutes. After 8 minutes, turn the top of the machine 180 degrees and turn back on. DO NOT TURN ON OVERHEAD LIGHT YET! Burn screen for 8 more minutes. Turn machine off, turn overhead light on and remove screen from machine. Now you're ready to roll! Step one: Place your burned screen into a tub of cool water and let sit for 10 minutes. Use your fingertips and a soft sponge to gently wipe away the emulsion from the burned areas of your screen. Be gentle. When all emulsion is removed from these areas and they're clear of any pink residue, you're all set. Let the screen dry. Step two: Slide your t-shirt form inside of your shirt, making sure the shirt is centered. Step three: Tape the back of the shirt so it's smooth around the front and there are no wrinkles or gaps. Step three: Attach the dry screen to the front of your shirt, make sure it's centered and you have the lettering placed where you want it before you print. Step five: Squirt a thick bead of paint across the top of the lettering on the screen. Be careful not to get any paint on the shirt! Use the squeegee to scrape the paint across the letters evenly. I do this from top to bottom, bottom to top, left to right and right to left. Remove the tape and gently remove the screen being careful not to blob paint on the shirt. Let the shirt dry before you wear it. That's it! Do you have a family favorite film? Is there a tag line you could use for your own Family Film Night t-shirts? We'd love to know! Share in the comments! Visit us on Facebook and join the crafty conversation and visit Margot and Avalon Potter at DIY Doyenne for more fashion and style. Thanks for the best blog.it was very useful for me.keep sharing such ideas in the future as well.this was actually what i was looking for, and i am glad to came here! Your screen printing embroidery machine is great. It makes the printing easy. I would love to have as well. That result is cool. I love it. 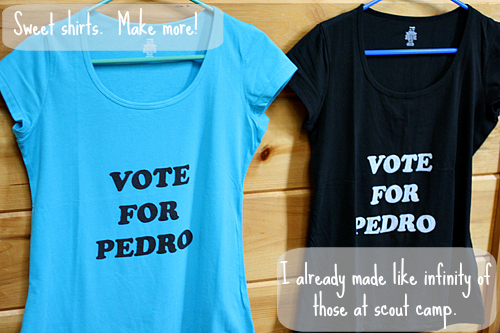 I love the shirt design it is cool casual fashion. Keep posting. I'm into tie dying shirts these days but I think having this screen printing machine is cool. These days the Lovely Long Sleeves Tiger Face Print T-shirt is a unique fashion. Your all images are really very beautiful. screen printed t shirts : We offer a broad selection of imprinted services, logo’s products and custom design services & business logo wear. Live expert help and fast turnaround. No one can stop you writing a perfect blog or article if you are passionate to your job. Your aim is to satisfy your readers with a well written blog and your passion is always behind your every successful assignment. Impressive writing skills can be observed over here.